I’m in the middle of packing up our apartment. Again. In our nearly 17 years of marriage, this will be our 11th move. Or maybe it’s our 14th? No, wait. 18th? Or maybe even 21st? I’ve lost track. I’ve been asked a few times recently how many times we’ve moved, and I’ve had to give vague answers. (It’s not quite as bad as “where are you from?” but still.) I sat down to write out all the times we’ve moved, trying to come up with a solid number, but it’s hard to calculate. Because, what counts as a move? When I was younger, my family moved fairly frequently, every three years or so. It was a very defined event. 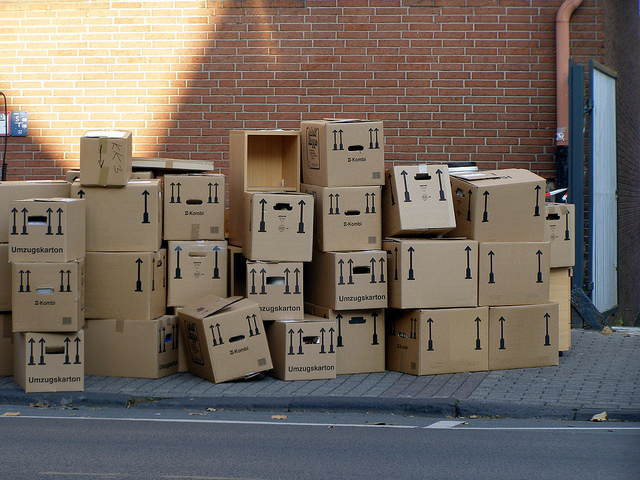 We’d pack up all our belongings into a moving truck, and we’d move to some new city. There was no question of it counting or not. It was clearly a move, end of story. Did you change your mailing address? No, not for every move. Our permanent U.S. address stays the same despite moving to different cities in China. And even in China, we don’t always have stuff sent to the address of our residence. So, this one is too complicated to help determine what is a move and what isn’t. Did you take furniture with you? We’ve never taken any furniture when moving between countries, but let’s all agree that those moves definitely count. Did you take all your worldly belongings with you? Nope. There’s always stuff in storage in the U.S. when we’re overseas, and stuff being stored somewhere in China when we’re in the States. Was it temporary? Did you intend to move again? Every single times we’ve moved, save one, we expected to move again relatively soon. Even that one time, we ended up moving again. To make things more complicated, we’ve sometimes moved from City A to City B and then back to City A. Does that count? Does it count as two moves? Because I sure as shootin’ did some major packing both times. I guess the only criterion I can think of that works for us is, did it feel like a move? It wasn’t a vacation, it wasn’t for fun; we changed to a new place that we viewed as our home for that time. If it felt like a move, then it was a move. Sometimes…I think about this and start waxing philosophical about how no home in this life is permanent. We’re all just temporary dwellers until we reach eternity. Sometimes…I start thinking how tiring it is to be uprooted and transplanted so often. If I were really a plant, I would have died long ago from all the re-potting. Sometimes…I think about how hard this lifestyle is on our family. All the good-byes. The constant flow of good-byes. There’s good stuff, too, don’t get me wrong. And sometimes that’s what I think about. The incredible people we’ve met, the stories we’ve been in the middle of, the experiences that will live in our hearts. But today, there’s not much time for thinking or calculating. There’s packing to get done. We’re moving exactly two weeks from today, and in the end, it really doesn’t make any difference which number move this is. We’ll move in, settle down, make new friends, learn a new city, work to impact a new community, and life will go on…until the next move. So, when I’m posed with the question, I’ll stick with my vague answer. How many times have you moved? A LOT. I packed the first box. It’s official. We’re leaving. I can relate! In my 19 years of marriage we have moved 16 times-two of those in China within four years. We will be repatriating back to the States in two months, which will be our 17th move, this one will be in a temporary place for up to three months, so we will have yet another move after that one into a rental home, then hopefully only one more when we finally settle into a home that we buy. I so long for that day! Best of everything with your upcoming move! Thank you, Sheila! And best wishes to you, too, for finding a home to buy and settling in for good. That sounds really nice, even if it will take you a couple more moves to get there.